Are you one of the many Star Wars fans who likes the idea of an Obi-Wan Kenobi Movie? Disney and Lucasfilm are still sitting on their hands with this one, but a dedicated disciple of the Jedi faith has just ensured that, if you weren't already excited about this prospect, you will be. It isn't official artwork, but this fan poster for the possible Obi-Wan movie is incredibly awesome. The poster made its way onto the Star Wars Subreddit and was created and posted by user Tom Lathom-Sharp. This definitely goes pretty far outside what Star Wars fans are used to in terms of posters. It is not a traditional poster. Instead, Tom Lathom-Sharp opted to do the one-sheet for the Obi-Wan movie in the style of a spaghetti western, and it is absolutely perfect. 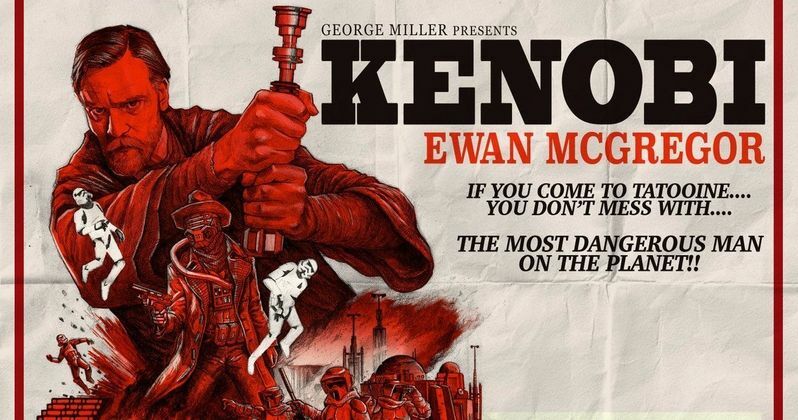 "I decided to draw and design my own poster for an Obi Wan Kenobi standalone film - in the style of a Spaghetti Western." Simply titled Kenobi, the poster imagines that this particular Star Wars movie would not be your standard affair in a galaxy far, far away. For one, it would be directed by George Miller (Mad Max: Fury Road), which fans would very likely have no complaints about. It also prominently features Ewan McGregor back as Obi-Wan Kenobi, a role that he has said he would return to many times. The poster also lists a few other cast members, including Joel Edgerton, who recently expressed interest in reprising his role as Uncle Owen, Allison Williams, Liam Neeson, who would presumably be a Qui-Gon Force Ghost as well as Tim Roth, who we're guessing would be the villain. Speaking of that, there is a very Cad Bane-esque bad guy on the poster as well. SirJediPanda also included a pretty solid tagline. "If you come to Tatooine, you don't mess with the most dangerous man on the planet." Despite the fact that Ewan McGregor consistently states that he would love to do an Obi-Wan movie, not to mention how popular the idea is amongst Star Wars fans, Lucasfilm has yet to pull the trigger on it. However, Lucasfilm President Kathleen Kennedy recently said that the next standalone Star Wars movie, which is currently slated for release in 2020, was going to be decided on this month. With D23 and San Diego Comic-Con both coming up next month, don't be surprised if Kenobi: A Star Wars Story gets announced. Even if Lucasfilm wasn't planning on announcing the next Star Wars standalone movie at either of those events, they may be rethinking that. Given what is going on with the young Han Solo movie right now, they need to do whatever they can to get some positive press. So, between D23 and San Diego Comic-Con, if they drop a new Star Wars: The Last Jedi trailer and announce the Obi-Wan movie, they'll be back in everyone's good graces for sure. In the meantime, be sure to check out the poster for yourself below.